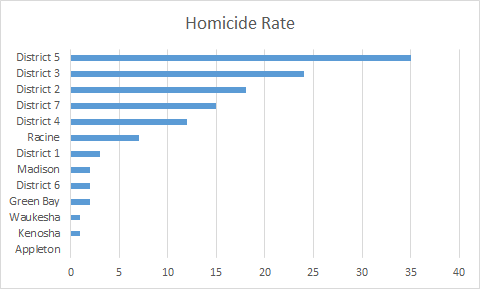 My most recent posts in this series have compared violent crime data from different cities. However, focusing on a single crime-rate number from a city may mask wide neighborhood-to-neighborhood variations within the city. So, what’s up with District 5? High levels of violence in the district seem to be linked to other forms of disadvantage and instability. For instance, District 5 has the lowest rate of owner-occupied housing among all of the districts (41%); by comparison, the much safer District 6 is 77% owner-occupied residential. Similarly, District 5 has the highest rate of tax-delinquent residential properties and the lowest marriage rate for its families with children. As the charts indicate, District 6 (Milwaukee’s largest district by population) appears essentially indistinguishable from other, similarly sized Wisconsin cities. 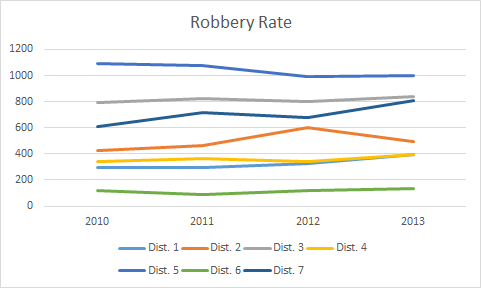 District 1 also fares well in homicide, but not so well in robbery. 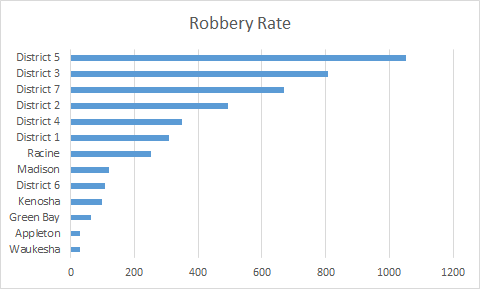 Milwaukee’s other districts, however, have much more significant crime problems. Again, District 5 especially stands out. 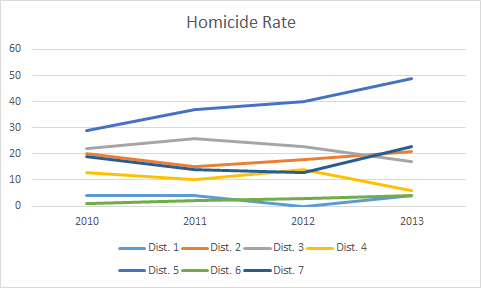 If District 6 is basically Madison East, District 5 is Detroit West — its homicide rate may be lower than that of the Motor City, but its robbery rate is higher. Very interesting. These figures would suggest we put more of our police resources into District 5. I wonder if that is being done?